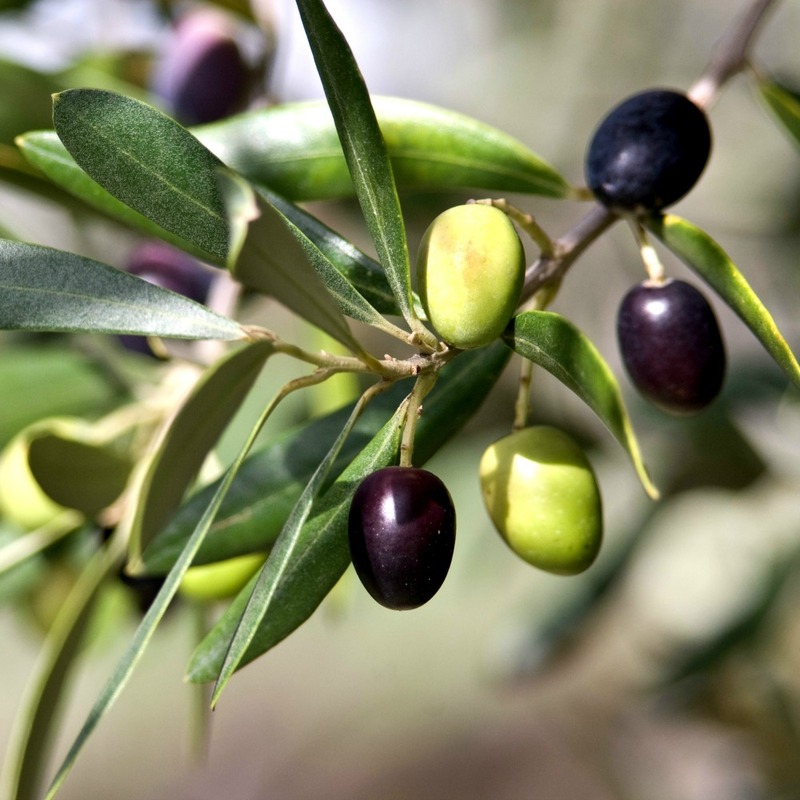 Greece’s green table olives come from the Halkidiki variety of olive tree (Olea Europea sp.) which is primarily grown in the Prefecture of Halkidiki, but also in Central and Eastern Macedonia, while a smaller number of trees of that variety are grown in other regions of the country. Internationally, they are sold under the name “green olives Halkidiki variety” and have a characteristically large fruit, cylindrical-conical shape with a pointed tip on the lower part of the fruit, a bright green or greenish-yellow colour, large ratio of flesh to pit, outstanding organoleptic characteristics, plus the flesh easily separates from the pit during pitting. Olives are picked by hand directly from the tree from mid-September to the end of October when they are in the right state of ripeness. After harvesting, the olives are processed and packaged at well-organised processing plants which have suitable tanks where the product undergoes curing and natural fermentation in brine, and then matures inside the same brine under constant monitoring by experts until the requisite organoleptic characteristics are achieved. 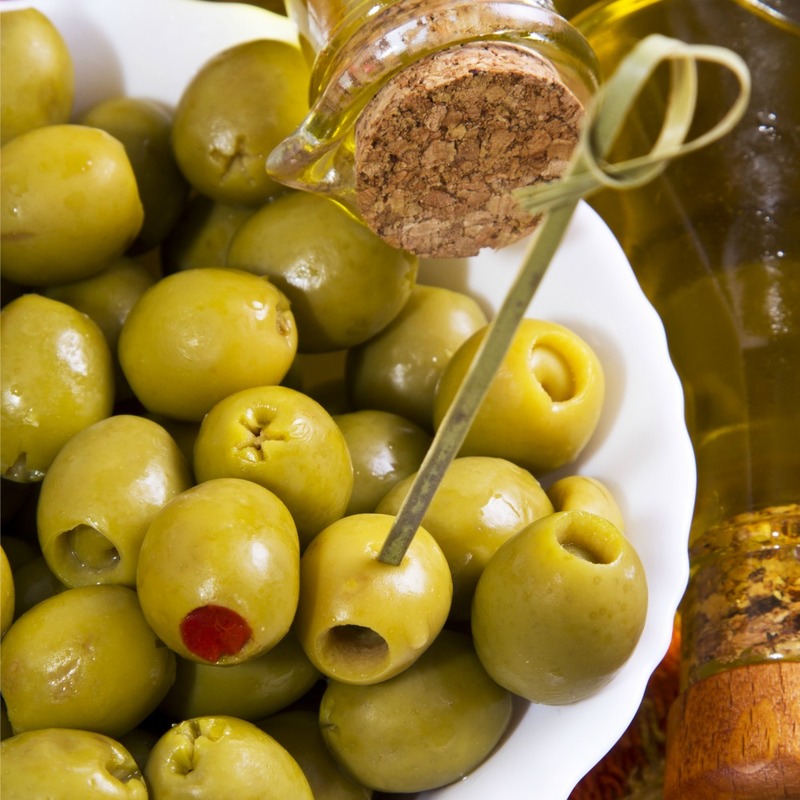 Curing, fermentation and maturation of the processed product can last from 2 to 6 months depending on how ripe the fresh olives were and the ambient temperature. The “green olives Halkidiki variety” are then removed from the tanks, sorted by quality and by size for commercial purposes. Around 30% of the olives sorted by quality and size are then sent to packaging lines and end up as “whole olives” in packages of various sizes, and as different products sold with a wide range of condiments and flavourings. Around 70% are pitted and also sold under a wide range of product codes such, and as pitted olives, olives stuffed with various fillings such as peppers, almonds, carrots, anchovies, garlic, onion and so on, in packages of various sizes, and with a wide range of condiments and flavourings. Greece’s “green olives Halkidiki variety” are a major export product which is in high demand, with the result that thousands of olive saplings of the Halkidiki variety are being planted every year in areas where this variety is grown. Natural black table olives of the Kalamata variety (Kalamata olives) come from olive trees of the Kalamata, Aetonycholia, Hondrolia, Tsingeli, Aetonychi, Nychati or Korakolia varieties (Olea europea var.ceraticarpa) which are grown in various parts of Peloponnese and central Greece. In order of output the top prefectures producing olives are this type are: Etolo-Akarnania, Laconia, Fthiotida and Messinia. Internationally these are known as “Kalamata olives”. Their reputation on both the Greek and global market is excellent due to the outstanding organoleptic characteristics of the end product, and their dark colour, crisp flesh and amazing flavour. The olives are picked by hand and/or using vibration machinery from early November to the start of winter when they have taken the right colour, but before they are fully ripened. After harvesting, the olives are taken to well-organised processing plants where they undergo natural fermentation and are preserved in brine. They are then matured in the same brine where they acquire excellent organoleptic characteristics under the continuous gaze of experts. The olives are then sorted by quality and size for sale, and are then sent for packaging and sale in bulk form or to be further processed as sliced or pitted olives (around 60% of the end product is sold as pitted olives). Numerous product codes exist because in addition to whole, sliced or pitted olives, packaged products can also be found along with a wide range of condiments and flavourings. 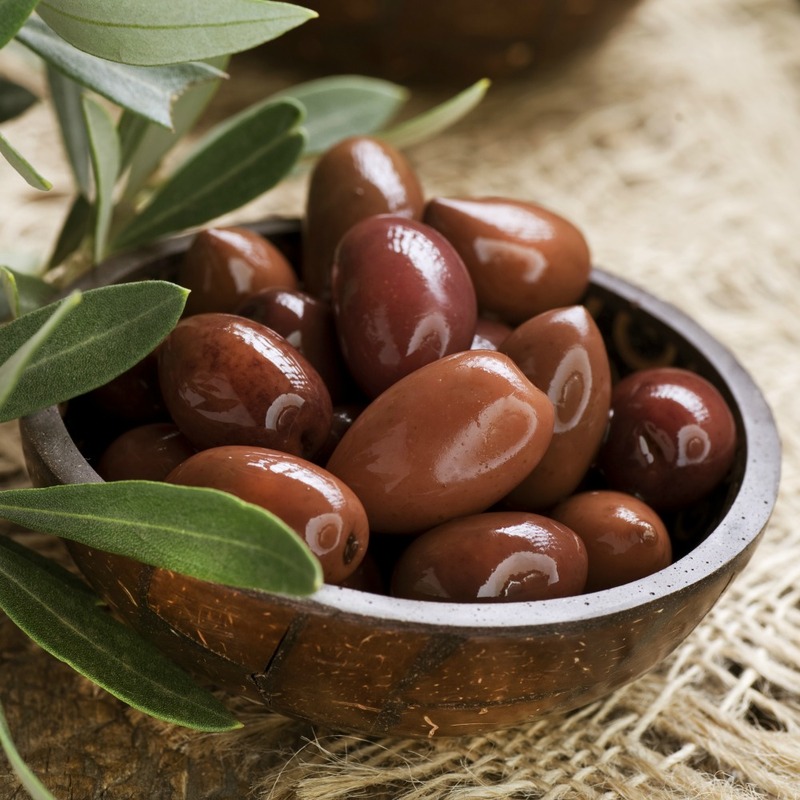 This internationally renowned type of Greek table olive, known as “Kalamata olives”, has strong exports and is in high demand. That means that every year thousands of olive saplings of the Kalamata variety are being planted, primarily in the prefectures of Etolo-Akarnania, Laconia and Fthiotida. Over the next 10 years it is expected that production from this variety will exceed 100,000 tons. • Natural black olives in brine. No matter how Konservolia table olives are sold, all are naturally fermented and the end product has outstanding organoleptic characteristics. Harvesting starts in September to collect green fruits and continues until the start of winter for natural black olives. The olives are picked by hand or using vibration machinery. After harvesting, the olives are taken to well-organised processing and packaging plants with suitable tanks depending on the type being made for sale, where the product is cured and naturally fermented in brine and then left to mature inside the same brine under the continuous gaze of experts. • of natural black olives lasts between 3 and 9 months. After fermentation and maturation is complete, the natural black olives are removed from the tanks to be packaged and are sorted by quality and size, packaged “as is” in various containers and sent for sale (primarily for export) under numerous product codes depending on the condiments and flavourings used. After fermentation and maturation green olives of the Konservolia variety are sorted by quality and size for sale. Around 30% are consumed as “whole olives” in packages of various sizes and various product codes, while around 70% are pitted and sold under various codes as pitted olives or stuffed olives in packaging of various sizes, with various condiments and flavourings.